Your Biodegradable & Natural Carpet Cleaning Choice! Benefit from high quality professional carpet cleaning and floor cleaning services in the Fremont area from M&R Premium Carpet Care, your full service residential and commercial carpet cleaner. Common dirt and grit can permanently damage your floors and result in unattractive fading, scratches and nicks. It is especially common for high traffic areas to be prone to dirt and grit which can give your otherwise beautiful floor a less-than-beautiful look. 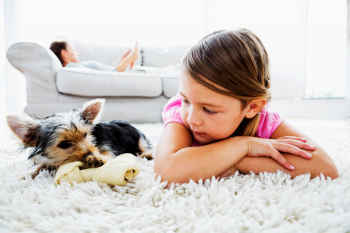 Get the best carpet cleaning for your home and your family with our green cleaning practices! Carpet repair experts advise that regular professional carpet cleaning and preventative floor maintenance will help ensure your surfaces are not only clean and look their best, but will also extend the longevity of your floors, and save you money over the usable life of your flooring surfaces. More Than 20 Years Of Cleaning Carpets And Surfaces! Our team at M&R Premium Carpet Care is committed to being your first choice for carpet cleaning services in the Fremont area. We offer both residential and commercial carpet cleaner solutions, and we specialize in a wide range of professional carpet cleaning tools. We are experienced with steam cleaners, carpet shampooers, carpet stain removers and carpet spot cleaning, chem dry carpet cleaning, carpet extractors, carpet steamers, and even carpet repair. We even offer 24-hour restoration services! Fremont’s trusted name for all of your home cleaning needs! Based on our many years of quality work, we are also proud to be one of the largest providers of upholstery cleaning and drapery cleaning. Plus, in addition to our superior cleaning services, our clients also have access to our top quality tile & grout cleaning, and air duct cleaning. Fremont carpet cleaning services you can trust! M&R is widely recognized for our impeccable reputation. Our customers receive the peace of mind that comes from knowing the work performed will be first quality and completed correctly the first time. As a reliable company with over two decades of experience in the Fremont area, M&R customers in need of a commercial carpet cleaner or residential carpet cleaner can count on our professional carpet cleaning expertise. Our steam cleaner, carpet extractor and carpet stain remover services at M&R are performed using industry leading truck-mounted carpet cleaning technology to remove the toughest stains – including ground-in soil – to restore the beauty of your carpet’s appearance. We also specialize in high quality supplementary services including carpet repair, deodorizer, and stain-resistant protective coating if desired. If you work or live in the Fremont area, and are in need of professional carpet cleaning, M&R Premium Carpet Care is your solution. We even provide emergency and rapid response restoration services 24 hours a day, seven days a week. For further details or to schedule your next appointment, call today!